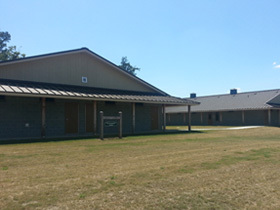 Camp John Hope FFA-FCCLA Center has approximately 200 beds in bunk cabins. All of the cabins have heat and air conditioning. Some cabins are handicap accessible. Please inform us if you require special accommodations. Some have individual rooms with 2 or 3 sets of bunk beds. Each room has a private bathroom. Some have one large bunk room plus a counselor room. There are partial walls that create "pods" of four beds for more comfortable lodging. The exact bed count varies between 26 to 30 beds. 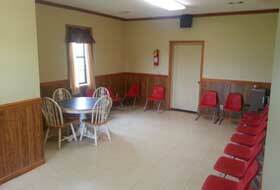 They have a common area with table, chairs, and couch. Bunk cabins do not come with linens, but linens can be provided for an additional charge. All of the bunk cabins are air-conditioned and heated. Each cabin is actually like two cabins in one. The two sides are completely independent, so groups can place two genders in the building. Only one door links the two sides, and that door can be locked or unlocked. 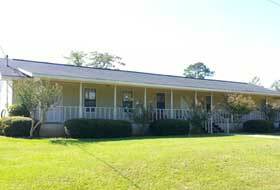 Each of the two sides has one large bunk room plus 2 counselor rooms. 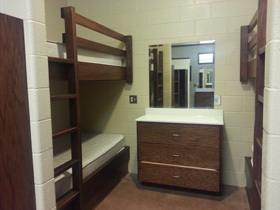 The bunk rooms and two of the counselor rooms are handicap accessible. The bed frames and furniture are oak. The top bunks have bed rails and permanent ladders. Each dorm shower has a small private changing area. The small lobby on each side can serve as a small group meeting area. The partial walls in the bunk room create small "pods" of four beds for more comfortable lodging. There are drawers and a mirror in each pod, plus there is storage room at the end of each bed.